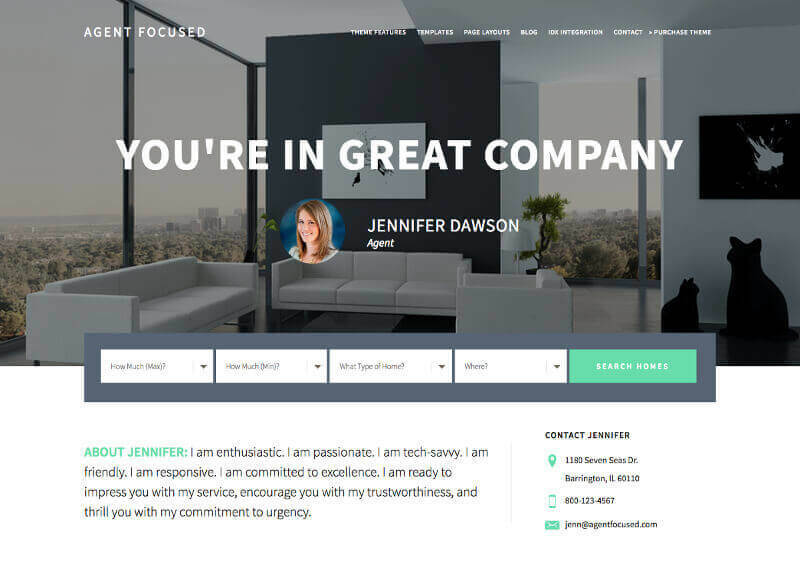 The Agent Focused Genesis child theme uses Backstretch, a jQuery script, to add the large image on the theme front page. A frequently asked question is how to get more control over the position of the background image. It’s fairly easy to convert the theme to use a CSS background image, which makes positioning more straightforward. The steps in this tutorial to add a CSS background image can generally be applied to other themes that have a backstretch image, although a few changes may be needed. First, we’ll comment out the sections that add the backstretch script. Next we’ll add a new function to add the body background-image style, both in front-page.php. And then we’ll add the positioning styles to style-front.css. All the code changes are in this GitHub Gist. <?php // Do not add this line when you copy and paste code. // Enqueue scripts for background image. // Load scripts only if custom background is being used. // Enqueue Modernizr for object-fit. Next in front-page.php, we’re going to add a new section that adds your image from the WP customizer as a background image to the front page. Add this code just below the section above. // Add background image style to WP head. // Add style only if background image is being used. So now let’s review what this code does. add_action( ... ) – This writes our background image CSS to the WP head. The if ( ... ) statement checks to see if we have a background image, and if we’re using a widget in Front Page 1 widget area. echo ...– This writes the CSS style, so it’s on our front page. The CSS to position the background image can be added to style-front.php or to a custom CSS editor. You can use the Additional CSS, now part of the WP customizer, (From the WordPress menu, Appearance > Customize and then choose Additional CSS) or a plugin. If using style-front.css, add the following just below the Table of Contents section, and before the rest of the CSS. It can be pasted anywhere in your Additional CSS or plugin. The line background-position: center center; is the one that we’ll use to change the position of the image. Now you can upload (using FTP) the edited files – front-page.php, and also style-front.php, if you edited there. Once that’s done, you may need to clear your caches for your site and your browser. Also you need to have some content in a widget in Front Page 1 widget area. Your image should be showing as a background image on your site now. The image fills the entire viewport, so not all of the image will be seen at one time, depending on the widget content you have added to Front Page 1 widget area, and the width of the browser window. The line background-position: center center; will help to position the image as you like. The first “center” centers the image horizontally from, left to right; the second “center” centers the image vertically, from top to bottom. If you change the image, you can easily edit the background position for your new image. Of course, you can use any combination of those; you can get more information about CSS background position here. Please let me know how it goes positioning your image. Hi Marcy, great tutorial – I was wondering, is there a way to rotate the image, in lieu of placing a slider in the widget section (which can’t be done on this theme)? I’m building a site using this theme, and looking to have a winter image and a summer image rotate between the two, but can’t think of how to do this. You may be able to modify this tutorial for the Winning Agent theme. The only difference that I can see right off is where you paste the code below the section marked Danger Will Robinson!. In Agent Focused, backstretch is loaded in front-page.php, and not functions.php. Another way to do it may be to use a slider plugin, such as Soliloquy. Follow this tutorial to comment out the backstretch code in front-page.php. You shouldn’t need the rest of the tutorial. Then in Appearance > Widgets, find Front Page 1. Just add the Soliloquy slider widget to Front Page 1 or use a Custom HTML widget to use the Soliloquy shortcode. You won’t need the text widget; you can use captions on the slider images.